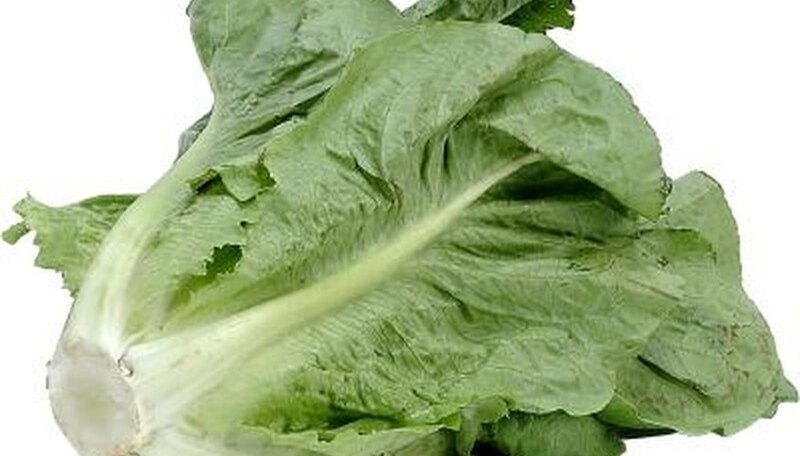 Romaine or cos lettuce (Lactuca sativa) forms elongated heads. Its leaves are bright to dark green, with red tinges in the red romaine varieties. Romaine has crisp, sturdy leaves that are used in Caesar salads. It grows in cool weather, but some varieties are heat tolerant. Romaine lettuce is a good source of vitamins A, K and C, as well as dietary fiber and trace minerals. Romaine lettuce varieties are green, red or speckled. Heirloom varieties are romaine lettuce types that have been grown or developed in various parts of the world with the seed saved and passed on from generation to generation. Parris Island Cos is named after the island of the same name and is one of the most common green varieties. Little Gem is very small and heat tolerant. Barcarole, Jericho, Verte Mar, Claremont, Little Caesar, Cosmo-Savoy Leaf and Freckles are other green romaine varieties that developed by seed companies. Red romaines are primarily red, green with tinges of red or speckled. Forellenschluss is an Austrian variety, whose name is German for speckled like a trout. De Morges Braun is from Switzerland with leaves that are apple green in the center and bronze to pink on the outside. Red Romaine and Cimmaron have primarily red leaves, especially when grown in cool weather. Cimarron has been cultivated since the 18th century. Rouge d'Hiver has dark-red leaves and was cultivated in France at least since 1885. Petite Rouge is a baby red romaine lettuce with red-tinged green leaves. Sow romaine lettuce seeds directly or start seeds in pots and transplant the seedlings to your garden. Lettuce prefers cool weather and withstands temperatures down to freezing. Lettuce does best when highs do not reach more than 60 degrees. Plant the seeds ½ inch deep and 1 inch apart. Thin them as the lettuce grows. Eat the plants you pull as baby lettuce. Lettuce varieties grow well together and have similar watering and nutrient requirements. Plant several varieties in one row for mixed salad ingredients. More than 95 percent of romaine lettuce commercially grown in the U.S. grows in Arizona and California. The U.S. Department of Agriculture's Agricultural Research Service in Salinas, California, released two romaine varieties -- SM09A and SM09B -- in February 2011 that are resistant to dieback disease and have a good shelf life. A 2000 to 2001 study by the University of Arizona Extension Program tested 10 romaine varieties for desirable characteristics. The study showed no significant difference in head size or weight among HMMX 7555 (Harris Moran), Conquistador, PAG 302, PIC MI, Big Heart, PIC 454, PSR 0566, Green Tower, Heritage and Grand Prize. Grocery stores sell all varieties as simply romaine lettuce.